WhatsApp is very important communication tool for people nowadays. We are going on to introduce and provide features of the website on How to Chat Online for iPhone devices. 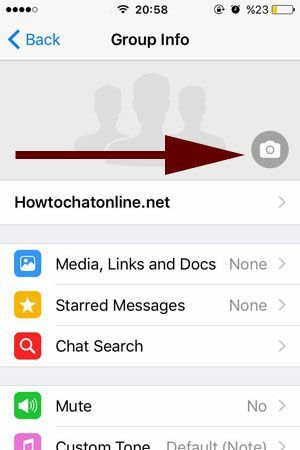 We will tell you about how to change picture of WhatsApp group chats on iOS devices on this page. 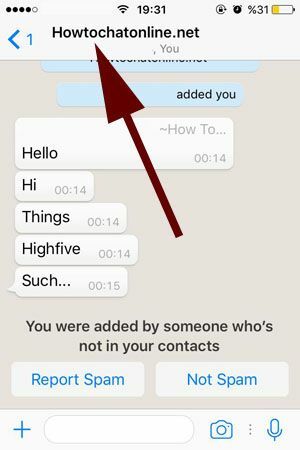 If you have any questions about WhatsApp groups or anything about the application, please let us know. A How to Chat Online staff will respond you as soon as possible. 2-) Enter the group chat that you want to change the picture. 3-) Tap on the name of the group name, please see the picture below. 4-) After you tap on the name of the group name, you will be in the Group Info page. You will see a little camera icon on the page. Please tap on that. 5-) There are three options that you can select. Take Photo: Camera will run on your iOS device if you choose this option. You will able to take a picture of you (or somewhere) simultaneously with this option and you will assign the picture to the group. Choose Photo: You will able to select a picture which you have taken with your device before with this option. If you select it, the application will redirect you to the gallery. Search Web: You can search a picture from websites with this option and you can use the picture on your group. All you need to do type a keyword to find a picture on this section. 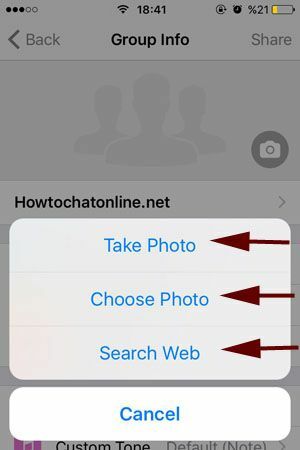 This is all you need to do for assign a new picture for WhatsApp group (or change the picture). Please contact us if you have any questions or comment this page.